Our wee squad was well shuffled for this 5th round tie. Out went Hammell, Casagolda and Murphy and in came Gunning, Hateley and Sutton. 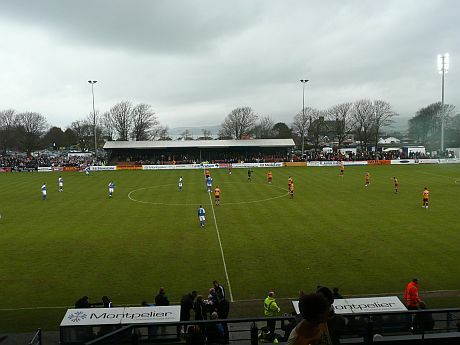 Stranraer kicked off facing the band of Motherwell supporters hidden in a yellow smoke cloud behind Randolph’s goal. Jones stayed upfield to keep Sutton company as battle commenced. Within minutes Lasley caught a boot in the ribs that forced his eventual substitution when Murphy replaced him after half an hour. Our composed passing game that was evident against Kilmarnock and Rangers was replaced by a nervous and stuttering showing that caused the home defence little trouble in the first half. Jones had an early shot and later a Haletey corner fell well for Sutton but his attempt was blocked. Stranraer had their first corner after twenty minutes and the home crowd found its voice moments later when Mitchell blasted high from a good position. It looked like we would reach the break without a goal but just after the fourth official signalled that four additional minutes were to be played we scored. This one will not feature in the goal of the round competition but it was welcome nevertheless. Saunders sent a cross into the box and it found its way to Jones inside the six yard box. His scrambled effort (not worthy of the description ‘shot’) crawled over the line despite the close attentions of Gallagher and Mitchell on the line. Stranraer pushed hard at the start of the second half and we had a few uncomfortable moments, though Randolph had few stops to make. Jones produced a run through the centre but shot high from twenty yards. Those who had hoped for an improvement in the quality of football found no comfort as the game progressed. Jones produced another fine run, this time with men free on either side but he elected to shoot. This time he dragged the ball yards wide of the left hand post as the home fane jeered. It was Hateley’s turn to miss the target when he launched a free kick over the top with twenty minutes left. Sutton then spurned a couple chances when he had time and space inside the box. Hateley had another free kick and for the first time the home keeper was tested. We got the second inside the last ten when Sutton slid in to convert a near post cross. The win was deserved but for long spells the gap between the teams did not look like three divisions. Jennings collected his second consecutive booking in this season’s competition and he’ll miss the quarter final.